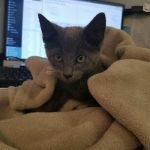 Meet Gray, otherwise referred to as “itty bitty kitty”! He was just hours away from death due to the fact that his pet parent died without having a pet trust or pet protection plan as a part of their estate plan. Gray’s story is not uncommon. Fortunately, the eldercare attorney overseeing the estate believed in rehoming abandoned animals. 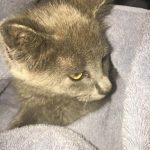 Gray is a feral kitten that was born in an outdoor shed just about the time his owner died. It was estimated that Gray, his mother and siblings lived with minimal food that was in the shed, rainwater and endured days of 90-degree heat. Prior to the mother cat giving birth, it was estimated that there were about nine other feral cats that lived on the property. After the owner died and before the funeral, the owner of the home’s two adult children got into a heated discussion. They were arguing over what to do with the deceased mother’s indoor dog as well as the many indoor cats. One child wanted to euthanize the perfectly healthy dog, cremate it and then bury it with its owner. The other child wanted to take the dog but was unsure if their spouse would agree to bringing another pet in the home. They knew that their mother had been working with an eldercare attorney and had made the attorney the executor of the estate. The two decided to consult the attorney to see if any instructions were left on what to do with the pets. There was not. Fortunately, the attorney’s internal compass felt that just because the pet parent died, the dog nor the rest of the animal’s lives should not end. Since, no arrangements were made for the pets and the children were unable to care for them, decisions had to be made and a plan had to be put into action acutely. One child’s spouse agreed to care for the dog, but was not willing to acquire any of the other animals. They did however agree to leave food and water out for the cats until arrangements could be made. Later that day I received a call from the attorney who was looking for recommendations on how to re-home the cats. 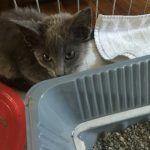 The good news is the county where the deceased resided has both a feline no-kill shelter, as well as a rescue that is dedicated to helping feral cats. The bad news is that this type of rescue/rehoming situation, is not what is considered to be an “owner surrender”, meaning the owner knows the health history of the animals and had made arrangements to bring the pets to the facility. First, someone from the no-kill shelter would have to go out to the home and assess the situation. Second, volunteers who are willing to help crate the indoor cats and bring them to the shelter would need to be found and finally, someone will need to arrange for a trap, spay/neuter & return program for the outdoor cats. All of this takes money. Fortunately, it was mutually agreed upon that the deceased’s estate would cover the cost through a charitable donation as a part of the estate settlement. So, what does it cost to rehome, trap spay/neuter and return? More than you might think! While each situation is different, there are some fixed costs as well as information that must be taken into consideration. Before we toss out a dollar amount, here is the very basic information that will need to be known regarding the animal itself. 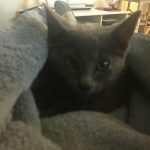 This information will let the rescue know if the pet can tolerate a foster home, must be quarantined or can reside at the shelter and finally need veterinary care. It will also help with the qualities necessary to rehome. If a pet is not good with other pets or children – this situation can be avoided. If the animal is declawed or has been an indoor companion only, being rehomed to a barn or spacious indoor/outdoor living area is not a good fit. As you can see, there is much to take into consideration when rehoming a pet. As a society, we place much thought into what kind of pet we bring into our home. We make arrangements for pet sitters when we travel. Pets are taken to the groomers and vet clinics on a regular basis. Heck some of us even arrange for pets to attend daycare for socialization. These are just the tip of the iceberg regarding costs associated with the responsibility of being a pet parent. We do this willingly and out of love. As a pet parent, don’t we owe it to our pet(s) to ensure that their lifestyle is not compromised or ends, just because ours does. Sadly, in most states pets are considered property and don’t have rights. Fortunately, this is starting to change. Until then, please consider establishing a pet trust when creating an estate plan or discuss this with your family make a plan. Please, don’t assume that everyone feels the same way about your pet as you do. Through thoughtful planning, you can ensure that your pet will be rehomed and loved, therefor not going to a kill shelter.